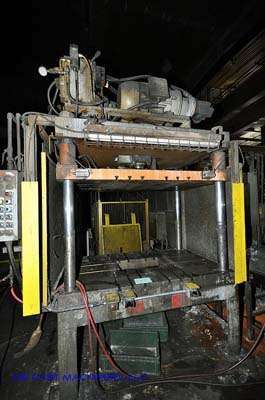 For Sale: One - Used - Second Hand - Metal Mechanics 75 Ton Four Post Vertical Trim Press. Inventory item: DCM-2184. One Used (second hand) Prince (Metal Mechanics) Model DCT-75 Vertical four post Hydraulic Die Cast Triming Press, New in 2002, Rated at 75 tons, Serial Number TA2022, Equipped with Allen Bradley SCL 5/01 Controls, one (1) side core/punch circuit, Air Safety Ratchet Device, Light Curtain, Dual Palm-Button Operation, Mechanical Ejection, Trabon Automatic Lubrication, T-Slotted Base Platen, T-Slotted Moving Platen, 61 inches (1549 mm) left to right by 37 inches (939 mm) front to back clearance between tie bars, 72 inches (1828 mm) left to right by 48 inches (1219 mm) front to back bed size, 40 inches (1016 mm) of daylight, 28 inches (711 mm) of stroke, 16 inches (406 mm) shut height, 24 inches (609 mm) by 16 inches (406 mm) cut-out in base platen, Cell Number 11, DCM Inventory Number 2184.